Joomla VirtueMart Dropshipping Management: Dropshipping is a process of supply chain management technique in which the retailer or vendor does not keep goods in stock, but instead transfers customer orders and shipment details to either the manufacturer or a wholesaler who ships the goods directly to the customer. The Extension provides admin with the facility where he can manage all the warehouses. Admin can add/edit or delete warehouse if needed and assign each product to a single warehouse. This increases the efficiency of the store by having the right products in stock and quick shipment to the customers. In addition to this now warehouse manager can login from front-end and update the order status as well and according to an intimation email regarding shipment status would trigger to the respective buyer. An Email will be notified to a warehouse of the concerned product after the order generation. Order Status can be set by Admin at which he wants the shipping request to be sent to the warehouse owner. 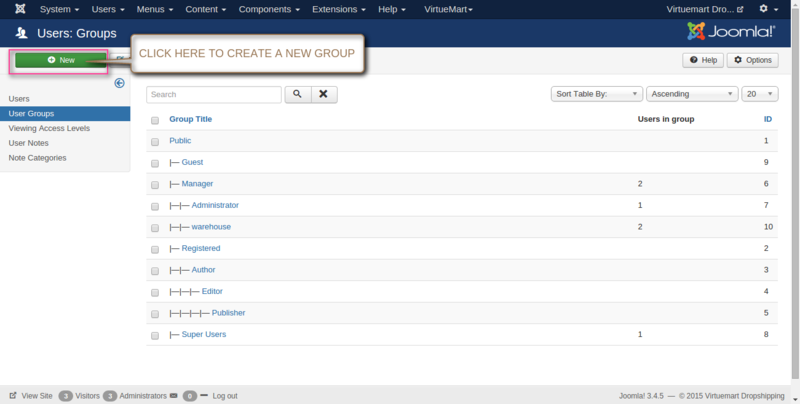 When you’ll download the Joomla Virtuemart Dropshipping Management extension will a zip file, use it. How to Use: This module is really very handy to use you just need to care about the things. A plugin gets enabled automatically and the component option must be saved with the parameters filled. After installing the extension, the plugin gets automatically enabled as shown below. Click to configure the plugin. Go to “User”, click on “Groups” to add a new group. Click to create a new user group. Click on Components and go to Dropshipping. 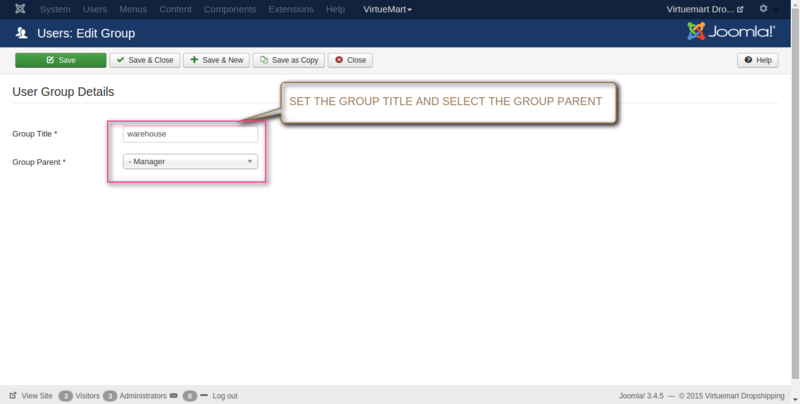 Set all the parameters here for the configuration filled and set user group id. Set the parameters as listed below in snapshot which includes the name and description of warehouse with the location details. 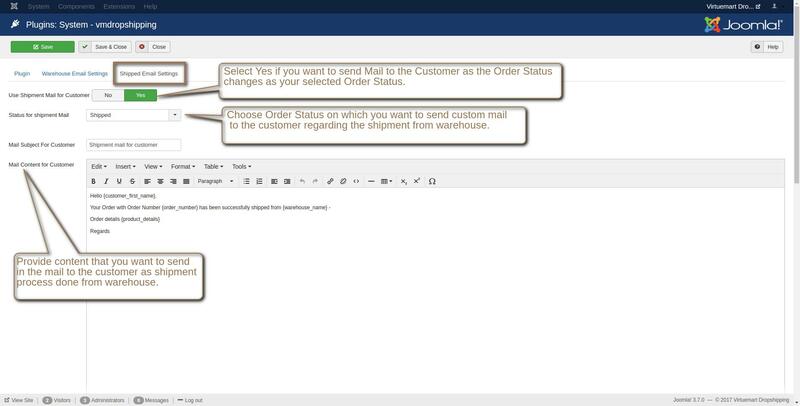 Option to assign multiple products to a single warehouse is viewed below. 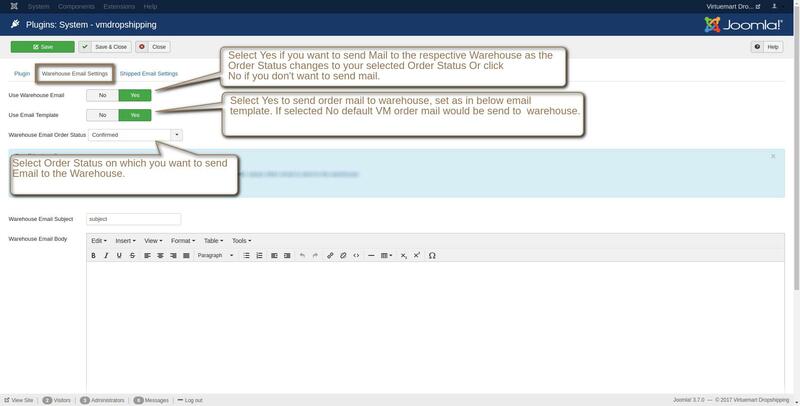 The feature to assign warehouse individually is also available. Select the warehouse the dropdown and click on “assign” as shown below. 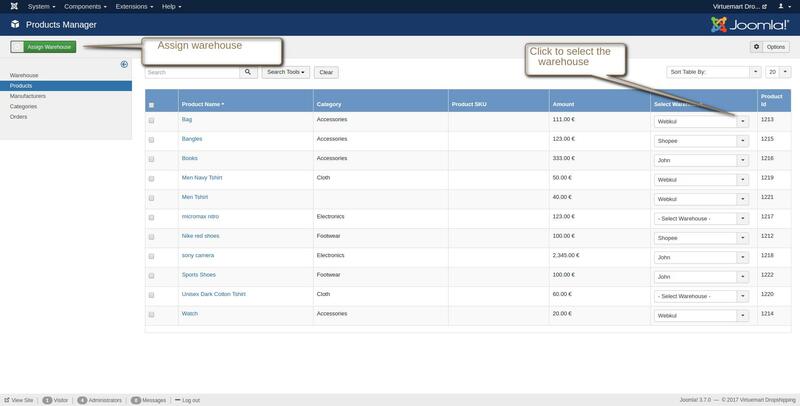 Select the manufacturer and click on “assign warehouse” to set a warehouse. 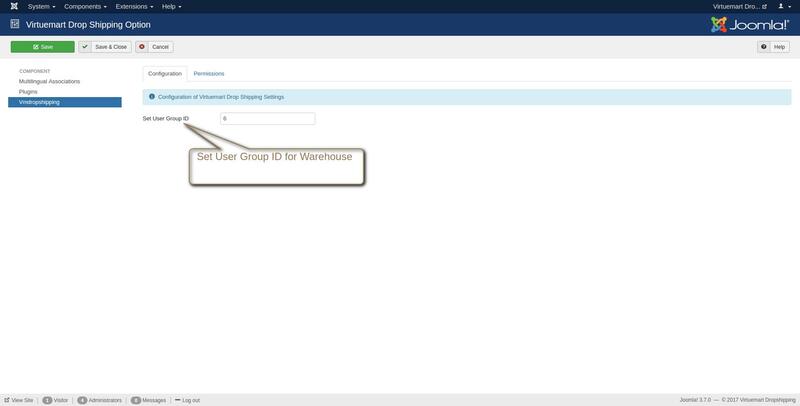 Option to assign warehouse individually is available. 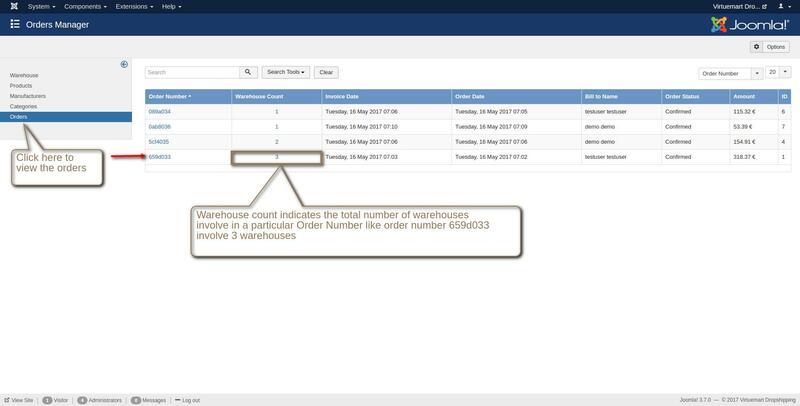 Select and click to assign multiple categories to a single warehouse. View of list of Orders. We ship some products from Canadian shippers to Canadian clients and some products from US shippers to American clients. Can we use your component to market them both on the same site and have Virtuemart correctly calculate shipping for both groups of clients? 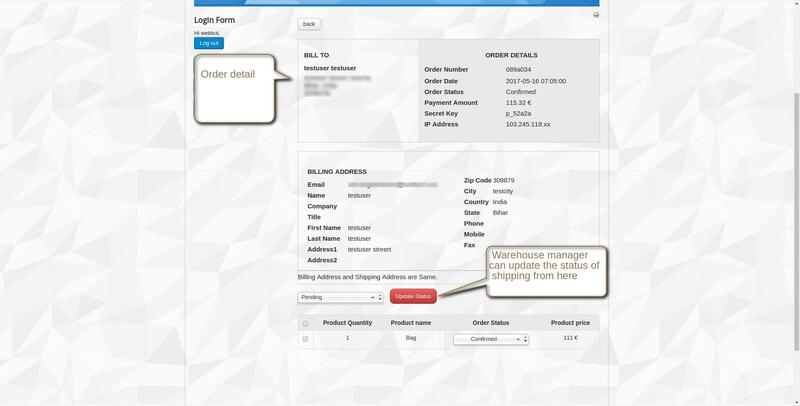 In this extension admin can assign the product to warehouses and warehouse can get the login information and view the order so that he can directly dispatch the product to the buyer, it does not calculate the shipping for shipper its already being handled by virtuemart.